Brook A. Niemiec, DVM, DAVDC, DEVDC, FAVD, earned his DVM from University of California, Davis. He is a board-certified specialist in veterinary dentistry of both the American and European Veterinary Dental Colleges. In addition, he is a fellow in the Academy of Veterinary Dentistry. He is one of fewer than 10 veterinarians worldwide to hold all 3 of these certificates. The WSAVA Dentistry Series is developed by Dr. Brook Niemiec in association with the World Small Animal Veterinary Association and Clinician’s Brief. A 7-year-old spayed domestic shorthair cat was presented for oral pain and inappetence following a professional dental cleaning performed at her regular clinic. Several teeth were extracted at that time due to tooth resorption (TR). No dental radiographs were taken. The patient was initially referred to an internal medicine specialist, who performed a thorough diagnostic investigation for systemic conditions, which included abdominal ultrasonography and CBC, serum chemistry profile, urinalysis, and total thyroxine levels; no significant abnormalities were identified. The patient periodically pawed at her face and shook her head. Oral examination revealed unhealed extraction sites with visible protrusion of tooth fragments through the gingiva (Figure 1). 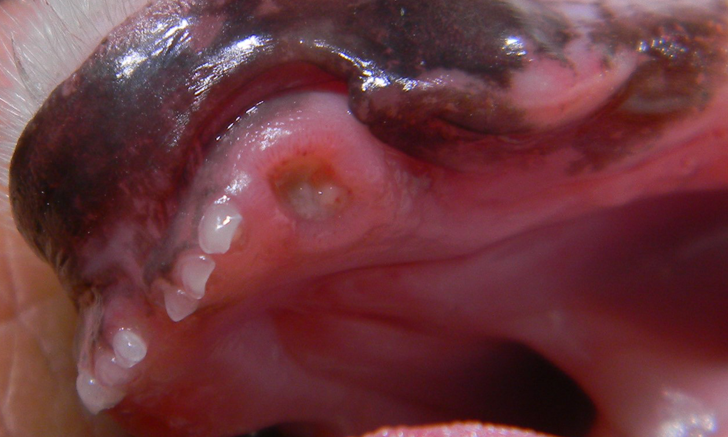 The areas were inflamed, and purulent exudate was present in the open alveolus of the right mandibular canine tooth (Figure 2; see Tooth Numbering). A complete oral examination and full-mouth dental radiographs were performed with the patient anesthetized. The detailed oral examination confirmed unhealed extraction sites with sharp crown fragments protruding from the alveoli into the oral cavity. In addition, an advanced TR lesion was noted affecting the left maxillary third premolar tooth (Figure 3). Dental radiographs confirmed advanced type 2 resorption affecting all involved teeth, as well as oral extension of the remaining tooth structure (Figure 4). 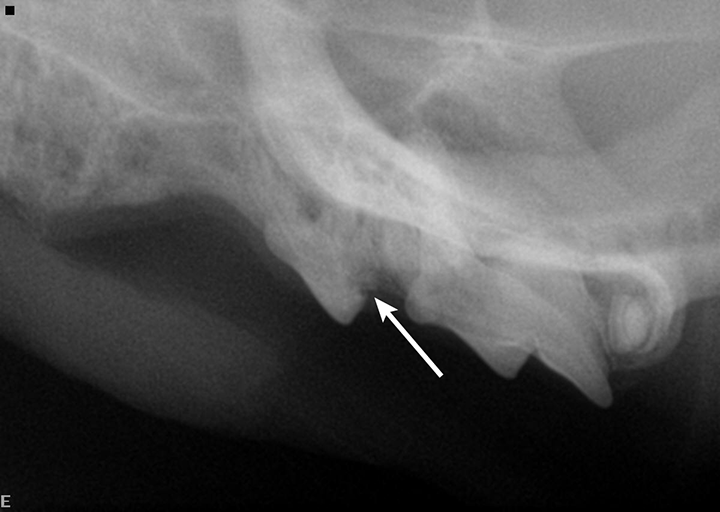 FIGURE 3 Intraoral radiograph of the left maxilla revealing type 2 tooth resorption on the third premolar (arrow). Extraction is indicated. After cleaning of the remaining teeth, regional nerve blocks were performed (bupivacaine 0.5% [0.2 cc at each site]), and buprenorphine (0.03 mg/kg sublingual) was administered as part of a multimodal analgesia approach. The patient was premedicated with midazolam (0.2 mg/kg IV), and anesthesia was induced with propofol (to effect) and maintained with isoflurane. Extractions and crown amputations (where indicated), alveoloplasty, and closure of the surgical sites via buccal mucosal flaps were also performed. The patient was discharged the same evening with appropriate pain management, which included sublingual buprenorphine and oral robenacoxib. The procedures removed the source of oral pain and allowed the patient to return to normal eating the night of surgery. Comfort was provided via perioperative analgesics and local/regional blocks. Recheck examination 2 weeks later revealed healed surgery sites, and the owner reported the cat to be more active and interactive than before surgery. There are 2 main types of TR: type 1 and type 2. Type 1 lesions present with advanced tooth/root resorption but without replacement by bone, whereas type 2 lesions typically present with the lost areas of tooth replaced by bone (ie, replacement resorption). Type 3 TR describes a tooth that has properties of type 1 TR on one root (or area) and type 2 on another. TR can be further categorized by the location and degree of resorption. Regardless of the type of resorption (replacement or not), staging can be performed (see Stages of Tooth Resorption). Although this is largely an academic exercise, staging can be helpful in determining appropriate care in some cases. Although numerous theories regarding TR etiology exist, none have been confirmed. TR is known to be caused by odontoclasts (ie, normal cells responsible for remodeling tooth structure). In the normal physiologic process, the resorbed tooth structure is replaced by odontoblasts; however, in TR, these cells are activated and do not downregulate. This, in combination with lack of normal repair, results in tooth destruction.11 Type 1 TR is typically associated with inflammation (eg, caudal stomatitis, periodontal disease).12 In these cases, it is thought that odontoclasts are activated by soft tissue inflammation. Type 2 lesions, in contrast, are generally seen in otherwise healthy mouths; however, the lesions often create local gingivitis. Type 2 TR is a noninflammatory replacement resorption that typically results in ankylosis. The etiology of type 2 TR remains unproven. Lesions start on the root and thus may be seen on dental radiographs prior to oral evidence. Dental radiographs are crucial in establishing proper diagnosis and treatment. Teeth with type 1 TR have normal root density in some areas, as well as a well-defined periodontal space. There is generally a clearly defined root canal in the intact part of the tooth. This type may involve significant resorption of the tooth and/or root(s) that is not replaced by bone. These teeth must be completely extracted. Teeth with type 2 TR have undergone significant replacement resorption. In these cases, the lost root structure is replaced by bone. Therefore, teeth with type 2 TR have a different radiographic density as compared with normal teeth. Radiographic findings typically include areas with no discernible periodontal ligament space (ie, dentoalveolar ankylosis) or root canal. In advanced lesions, there is little to no discernible root structure (ie, ghost roots). Crown amputation requires creation of a gingival or mucoperiosteal flap and removal of the tooth structure to approximately 1 mm below the alveolar margin using a carbide bur on a high-speed, water-cooled handpiece. Alveoloplasty is performed to remove any shards of bone prior to closure of the surgical flap. Crown amputation is not recommended in cases of caudal stomatitis. Improper treatment that leaves patients in pain, as well as with untreated inflammation and infection, is a significant animal welfare concern. In this patient, the open extraction sites and rough tooth surface allowed for continued discomfort as well as inflammation and infection, causing patient distress manifested by anorexia, pawing at the mouth, and head shaking. 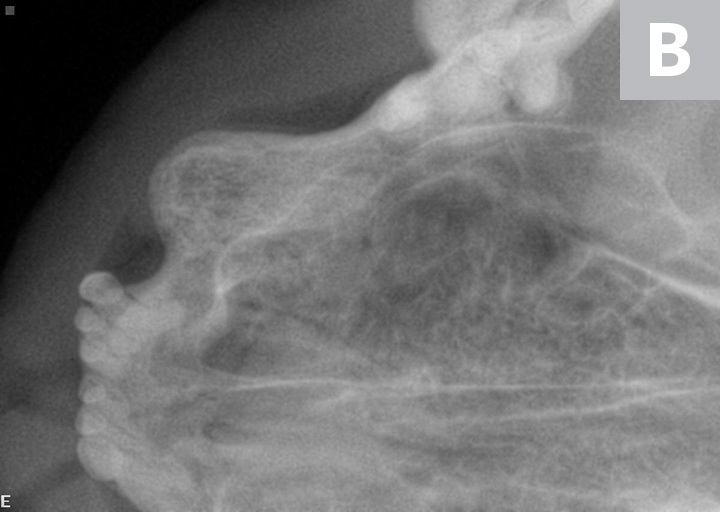 Practitioners are urged to further their skills in treating this condition by engaging in hands-on training in dental radiography and extraction techniques. What is tooth resorption (TR)? TR results from activation of odontoclasts by an unknown cause. Type 1 TR is believed to be a response to chronic inflammation and is commonly seen in cases of advanced periodontal disease or caudal stomatitis. Type 2 TR has an unknown cause; although it often appears similar to caries in humans, it is not bacterial in origin. What radiographic signs are necessary for crown amputation to be an accepted treatment? Crown amputation is an accepted procedure for TR, but only in cases of advanced type 2 resorption. In these cases, the root is replaced by bone and therefore there is no endodontic system or periodontal apparatus to allow for continued pain and/or infection. Crown amputation should never be performed on teeth with type 1 TR and must be reserved for only the most advanced cases in which no identifiable tooth structure remains. Crown amputation should never be performed without dental radiographs. Is type 1 TR in cats associated with any other oral disease? Yes; there is an association between type 1 TR and periodontitis. Yes; there is an association between type 1 TR and fractures. Yes; there is an association between type 1 TR and oral tumors. Type 1 TR is commonly associated with advanced periodontal inflammation or stomatitis. In fact, it is not uncommon to see type 1 TR in cats under a year of age that have been diagnosed with feline juvenile periodontitis. Should teeth with resorption always be treated in cats? No; teeth with completely subgingival type 2 lesions may not require treatment. No; teeth with advanced type 1 lesions may not require treatment. No; teeth with stage 1 and 2 lesions of either type do not require treatment, as the pulp is not involved. In humans, subgingival TR is not known to cause pain. Therefore, most veterinary dentists recommend no therapy in these cases. If extractions are not performed, regular radiographic and clinical monitoring are strongly encouraged. However, any tooth with oral extension (ie, where the lesion can be seen or felt) requires extraction. How are teeth with type 1 resorption lesions treated? Type 1 TR lesions have not undergone replacement by bone and maintain an endodontic system and periodontal ligament. Therefore, crown amputation is not an acceptable form of therapy in these cases. All type 1 lesions with oral extension (ie, most type 1 lesions) require complete extraction. Reiter AM, Lyon KF, Nachreiner RF, Shofer FS. Evaluation of calciotropic hormones in cats with odontoclastic resorptive lesions. Am J Vet Res. 2005;66(8):1446-1452. Lund EM, Bohacek LK, Dahlke JL, King VL, Kramek BA, Logan EI. 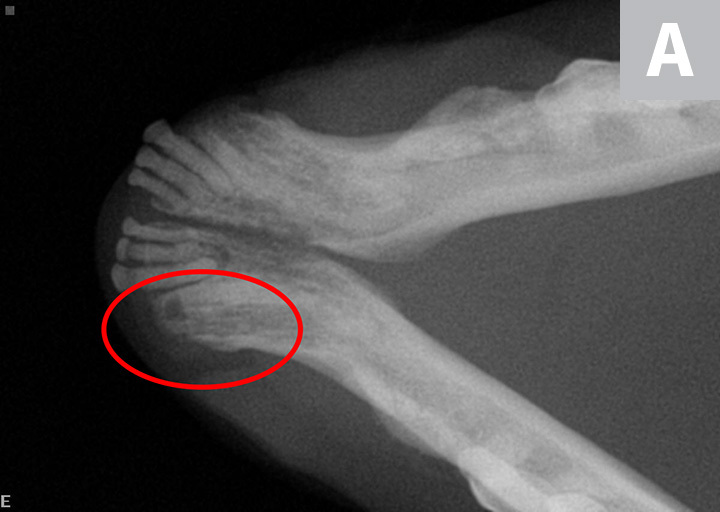 Prevalence and risk factors for odontoclastic resorptive lesions in cats. J Am Vet Med Assoc. 1998;212(3):392-395. Dupont G. Pathologies of the dental hard tissues. In: Niemiec BA, ed. Small Animal Dental, Oral and Maxillofacial Disease. Boca Raton, FL: CRC Press; 2010:128-159. 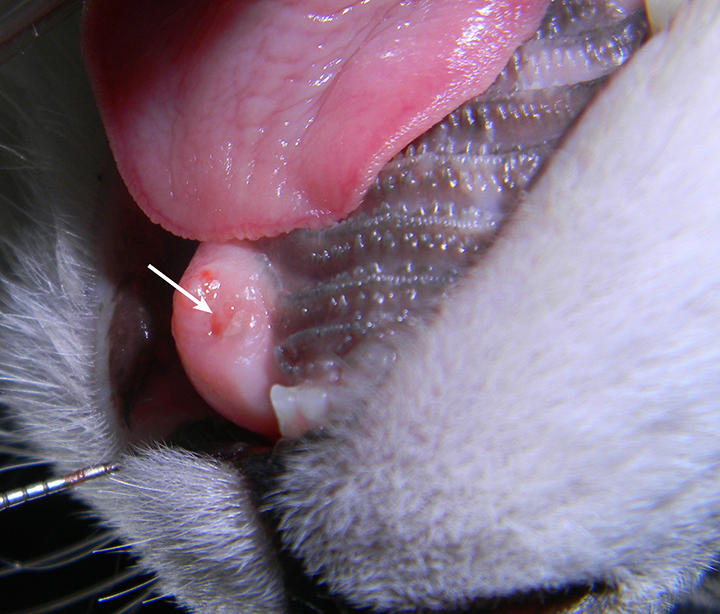 Pettersson A, Mannerfelt T. Prevalence of dental resorptive lesions in Swedish cats. J Vet Dent. 2003;20(3):140-142. Ingham KE, Gorrel C, Blackburn J, Farnsworth W. Prevalence of odontoclastic resorptive lesions in a population of clinically healthy cats. J Small Anim Pract. 2001;42(9):439-443. Mestrinho LA, Runhau J, Bragança M, Niza MM. Risk assessment of feline tooth resorption: a Portuguese clinical case control study. J Vet Dent. 2013;30(2):78-83. Holmstrom SE, Frost Fitch P, Eisner ER. Endodontics. In: Holmstrom SE, Frost Fitch P, Eisner ER. Veterinary Dental Techniques for the Small Animal Practitioner. 2nd ed. Philadelphia, PA: WB Saunders; 2004:312-317. Niemiec BA. Oral pathology. Top Companion Anim Med. 2008;23(2):59-71. Bellows J. Oral pathology. In: Bellows J. Feline Dentistry: Oral Assessment, Treatment, and Preventative Care. Ames, IA: Wiley Blackwell; 2010:101-48. Bellows J. Radiology. In: Bellows J. Feline Dentistry: Oral Assessment, Treatment, and Preventative Care. Ames, IA: Wiley Blackwell; 2010:39-100. DeLaurier A, Boyde A, Jackson B, Horton MA, Price JS. Identifying early osteoclastic resorptive lesions in feline teeth: a model for understanding the origin of multiple idiopathic root resorption. J Periodontal Res. 2009;44(2):248-257. Farcas N, Lommer MJ, Kass PH, Verstraete FJ. 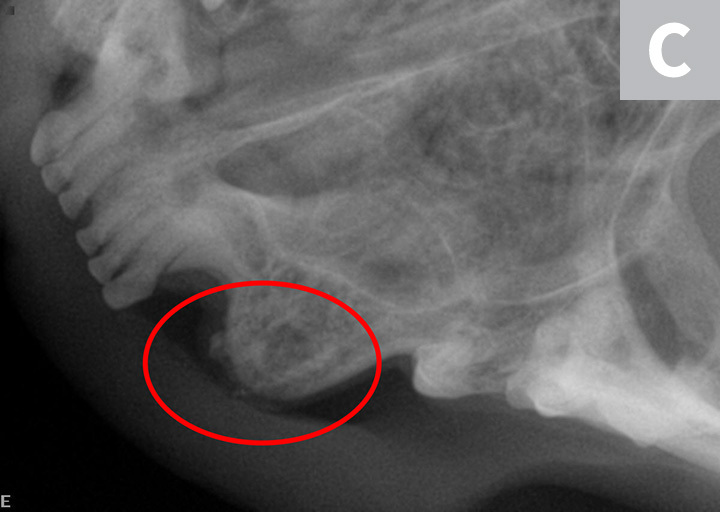 Dental radiographic findings in cats with chronic gingivostomatitis (2002-2012). J Am Vet Med Assoc. 2014;244(3):339-345. DuPont GA, Debowes LJ. Comparison of periodontitis and root replacement in cat teeth with resorptive lesions. J Vet Dent. 2002;19(2):71-75. DuPont GA. Crown amputation with intentional root retention for dental resorptive lesions in cats. J Vet Dent. 2002;19(2):107-110. Bellows J. Treatment of tooth resorption. In: Bellows J. Feline Dentistry: Oral Assessment, Treatment, and Preventative Care. Ames, IA: Wiley Blackwell; 2010:222-241. Niemiec BA. The importance of dental radiology. Eur J Comp Anim Pract. 2011;20(3):219-29. Reiter AM, Soltero-Rivera MM. Applied feline oral anatomy and tooth extraction techniques: an illustrated guide. J Feline Med Surg. 2014;16(11):900-913. Bellows J. Feline Dentistry: Oral Assessment, Treatment, and Preventative Care. Ames, IA: Wiley-Blackwell; 2010. Niemiec BA. Feline Dentistry for the General Practitioner. San Diego, CA: Practical Veterinary Publishing; 2015.